Back in December 2008 and again in 2009, former Vice President Al Gore said that in the next 5-7 years the Arctic Ice cap will be gone entirely during some parts of the summer. Sadly for Al and his climate change enthusiasts, the opposite has happened. I would suspect that Gore has put the Arctic on his Christmas naughty list. On the bright side, I doubt very highly the former vice-president will be putting coal in the stockings of anyone on his naughty list. Add Al Gore’s name to the list of people we need to hold accountable in five years’ time. He’s told an audience in Germany this week that the North Pole ice cap will vanish in summer months in five years. On the graph below, which was published at Climate Depot, we can see that in 2018 the Arctic Ice cap (blue) is significantly higher than the average of the past eleven years. 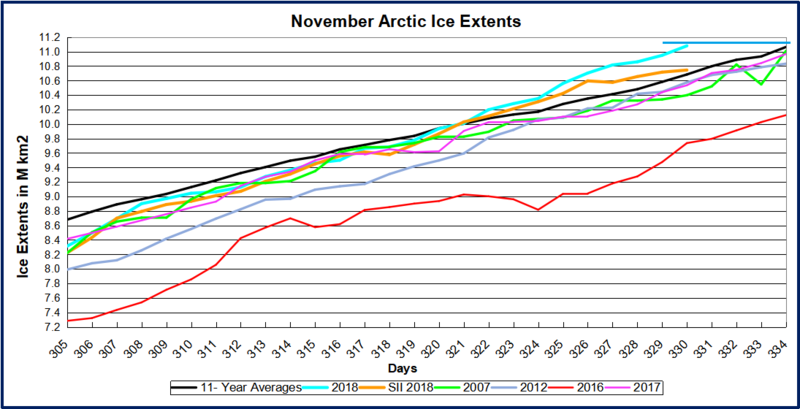 Arctic sea ice has in fact stabilized over the past 10 years. This year the Northwest passage was closed the entire year. Arctic sea ice extent has exploded since early November, gaining over 200,000 km² daily on average. In other words, the Polar Bears are having a party and singing the song below from the Broadway musical, Spamalot. Sadly for the former VP with the tense Chakra, his climate change predictions are falling apart. Sorry Mr. Gore but closing your eyes clicking your heels together three times while saying “there is a climate change consensus” will not make your arctic predictions happen.